Blue-gray Tanager is a bird reasonable to expect in the U.S. as a vagrant someday…they are common in many habitats in eastern Mexico. If and when one does show up in a feasible place, brace yourself for the coming “birds have wings” debate. Hello Birdosphere! The last couple of months I’ve used this space to talk about birds…but let’s face it, lots of birders out there are capable of discussing all things avian. Let us return to one of my other favorite topics: birders. Recently, it seems that more and more often birders will remark in online forums that they despise this phrase. The nerds are getting agitated. But why? I can think of three reasons, although I expect more are out there. First, its a cliche. Second, it can come off as a lazy excuse to explain the natural provenance for a particular bird, which can be infuriating if you are in the midst of a tense and overwrought exchange via listserv/Facebook group…and if you are someone who is a cage bird conspiracy theorist, this is probably the worst thing you could ever hear. Third, let’s all be real and admit that some very accomplished birders out there are not very accommodating when it comes to hearing about less experienced birders fiending to add something suspicious to their lists. Now, as a serious birderer, I usually enjoy seeing passive-aggressive, nasty, petty and childish exchanges between birders manning the front lines of the internet. You may think its sad, and you would be right…but I assure you that it is also hilarious. Just to be clear, I do not have a particular problem with this phrase, and I have never complained about it to anybody…I have never used the phrase either. As the world’s One True Birder, I know it is up to me to be a leading example to all, a shining beacon of wisdom to penetrate the cold darkness of nerddom. My thoughts? If you are going to use this phrase, hopefully you have something else to offer to the conversation. 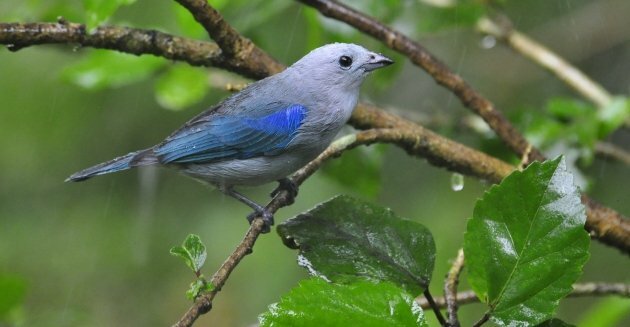 If you really think that (hypothetical) Blue-gray Tanager wandered up to the Lower Rio Grande Valley from eastern Mexico, what is your reasoning? In and of itself, “birds have wings” is not a very compelling argument for birds being far from their expected range. A good conversation is one with good substance, no? If this phrase really irks you, take a step back for a second. Do you really want to fall into that classic nerd-trap of getting really worked up over something so trivial? Take a deep breath. It’s really not a big deal. If you are tempted to exercise your aggravation about it in a public forum, think about how many people can see that and how many are getting a laugh at your expense. But the people you really should be worried about are the birders who don’t have the stomach for all this cybersniping; they will drop out of the discussion, and even out of the community, because they didn’t expect all the drama that comes with being an online birder. That said, we are adults. There is room for disagreement and criticism in our discussions….I hope. That’s all for this month friends. Until next time…bird hard, and prosper. Here in South Florida we have this debate all the time because so many people from Latin America capture and bring “home” birds here as cagebirds. Cuban Grassquits are a favorite. From 1960 through the mid 1970s we had numerous Blue-gray Tanagers here, and they bred. Did they have wings, or airline tickets? Who knows, but more than one local has them on his life list. What would you do with our one and only Great Black Hawk, who has lived on Virginia Key for at least 30 years, and is probably the same (very old) bird that keeps being seen? Hasn’t he (she?) achieved resident status yet? Where’s Marco Rubio when you need him? Florida has an ancient Great Black Hawk??? No matter how it got there, that is incredible. What will they say when a Greater Rhea shows up in Texas? “Birds have legs. They use them”? You got me Jochen…LOL happened. The term “birderer” has made my day. I’ve seen it in use around the Birdosphere in a couple places, but as far as I know Seagull Steve coined it a while ago. Glad to be of service, Jen of the Flycatchers.